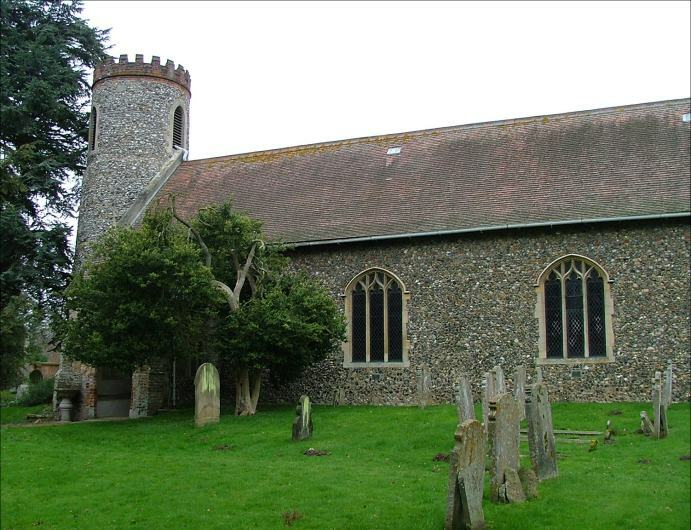 I later discovered that Norfolk has three churches with unique dedications. At Bixley, Woodbastwick and here, the church is the only Anglican parish church in England with that particular dedication. Completely by chance, we had visited all three of them on this particular morning. Gervase and Protase were twins, and early martyrs in Rome; probably at about the same time as St Valentine, and with as much likelihood of ever having existed. I assume the use of the dedication here is the enthusiasm of a 19th century Anglo-Catholic Rector. The placing of the 18th century font outside the porch, perhaps to act as a holy water stoup, would suggest a similar leaning. Or perhaps not. Perhaps it is meant as a bird bath. I have no idea of the current positioning of the parish in the Anglican firmament, because the church was firmly locked, as so many are in this area. There are two keyholders, but both of them were out. So, we wandered around the graveyard, which is pleasantly overcast by pine trees, and almost entirely surrounded by the grounds of Little Plumstead Hall. This was for many years a secure hospital for people with learning disabilities, and part of it still houses the famous Broadland Clinic, but most of the site is now being sold off for housing. So Little Plumstead will be come more suburban, and this little corner will have to hold its own. The exterior of nave and chancel is that of a rather dour restoration, but if you look closely there are some points of interest. The south doorway has a billet hood moulding, showing that it is Norman, and while the tower is also Norman I think it is safe to say that the nave was built before the tower - rather than the walls of the nave conforming to the round outer wall of the tower, the tower has been built against a flat wall. A gravestone immediately to the south-east of the porch is to the splendidly named Moses Boast, who I assume was a burly, bearded giant of a man, perhaps a blacksmith. I assume he was a churchwarden here. Inside his church, I know there are monuments, a brass, some continental glass, all of which I would have liked to see. But this was not to be. Perhaps my path will cross with that of Moses Boast again.